Picture it, a backdrop only a great artist could paint. Maybe a glowing orange sunset on a sugar sand beach or the gazebo in historic Apalachicola's Lafayette Park covered with ribbons, seashells and fresh cut flowers. 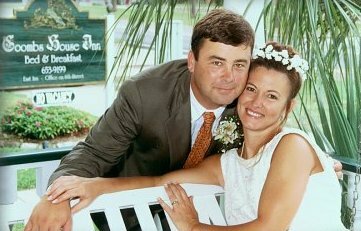 Not only is Franklin County a great place to come, relax and enjoy some great seafood, it its also a wedding couple's dream. Our area has many historic churches, tree-lined parks and beautiful white sand beaches that make the perfect setting for a wedding or reception. First United Methodist Church is located on Highway 98 and 5th Street. The present structure was built in 1901, after fire destroyed the original 1846 church. The church is available for ceremonies and has a reception hall next door. (850) 653-9530. St. Patrick Catholic Church is located on 6th Street between Avenue C & B. The Romanesque style building was built in 1929 and has great wooden pews and beautiful stained glass windows. St. Patrick's also offers a fellowship hall that accommodates two hundred people. (850) 653-9453. Trinity Episcopal Church is believed to be the sixth oldest church in the state of Florida, the second oldest church still holding services. It was built in 1836. Trinity's fellowship hall can be rented. The church's great steeple is a stopping point for many visitors. (850) 653-9550. First Baptist Church was first organized in the mid-1800s. The present building was erected in 1902. The church is noted for its beautiful stained glass windows. (850) 653-9540. Love Center Holiness Church of the Living God 151 10th Street. (850) 653-2203. St. George Island United Methodist Church (850) 927-2088. First Baptist Church (850) 927-2257.